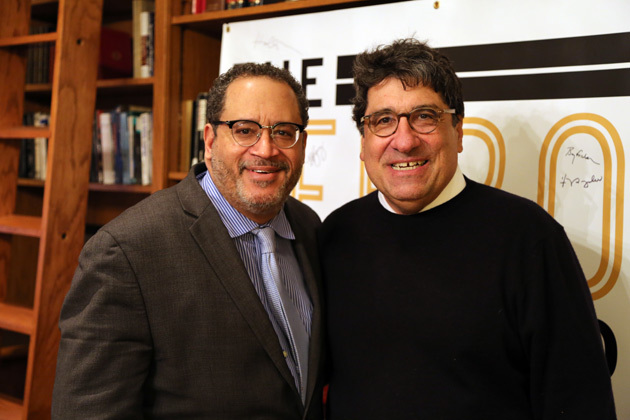 Before Michael Eric Dyson, University Professor of Sociology at Georgetown University, took the stage at Langford Auditorium for the Martin Luther King, Jr. Commemorative Series, he conversed with Chancellor Nicholas S. Zeppos about core American ideals that often emerge in the national discourse when remembering King’s legacy. In the latest episode of The Zeppos Report, Dyson acknowledges the profound impact that King brought about in his own intellectual journey. “When I saw him on television, it instantly attracted me to the use of words to move people,” Dyson said. Dyson is known by many as a “hip-hop public intellectual” that discovers the seams binding religion, pop culture and social justice together. Some of his first published works, such as Between God and Gangsta Rap: Bearing Witness to Black Culture (Oxford University Press, 1996), speak candidly to the intersections of racial justice, spiritual praxis and mainstream American media. His newest work, Tears We Cannot Stop: A Sermon to White America (St. Martin’s, 2017), provides unique insights into Dyson’s personal worldview shaped by his years as a Baptist minister and trained sociologist. “Justice is what love sounds like when it speaks in public,” said Dyson, quoting his book. In the podcast, Zeppos moves the conversation toward the pertinent topic of race and sports in America, citing Vanderbilt’s newly announced Center for Sports and Society as an important step in exploring the role of this cultural intersection. Dyson and Zeppos both agree that sports remains an important catalyst in American contemporary life. “Sports certainly provides a mirror that reflects division, struggle, but also the formation of community among people,” Zeppos said.